GOOD FOOD IS SIMPLE. TRY THIS YUMMY FALAFEL RECIPE! You know what truly marvels me about food? Somewhere along the way we (human beings) complicated it so much for ourselves that it became easier to switch off and mindlessly fuel our bodies with exactly what it doesn’t need. Bizarre really. I mention this today because over the years I’ve experimenting with many different things in the kitchen – making alot of basic, everyday foods from scratch (yoghurt, sourdough, sprouts) to the most complex or delicate. But the one thing that keeps me grounded is when I visit my parents kitchen. It still has the same scratched, burnt, worn table in the centre where we always congregate to talk, eat, share. And each and every time I go there I relearn something about food that I once knew or I discover something new. But, the foundation to each of those learnings is that food, really healthy, nourishing food is easy. It’s no complicated at all. We just need to switch on! We just need to care a little more about what we consume, respect our bodies and what they do, enough to try a little harder and give it what it needs. In the end, it’s not hard at all, but so, so simple.No excuses really. And this is not about whether you can cook or not. One recent trip to my favourite place in the world, my parent’s kitchen, offered up the easiest and simplest recipe. 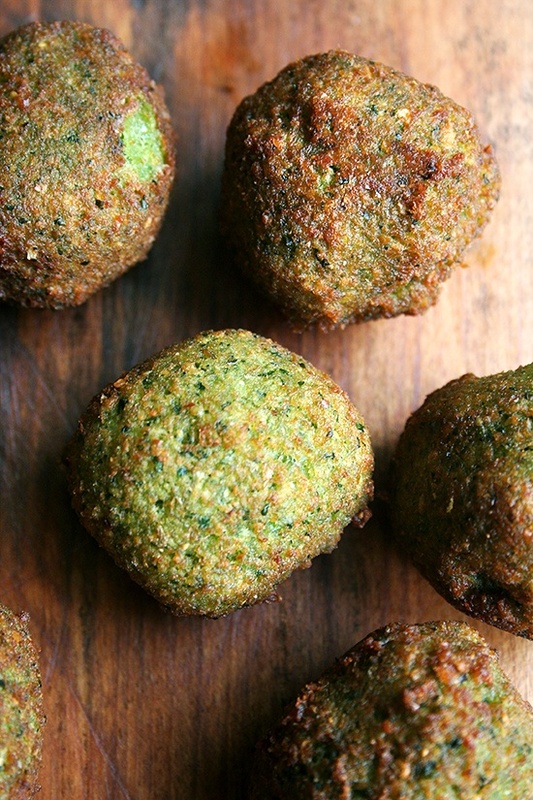 Lebanese falafels. I know these are easy, but I’d just forgotten. So I’d like to share this recipe with you, so you too can see how simple and easy cooking can be. No masterchefs here, just fresh, simple, wholesome food. Just a note, this recipe makes a MAMMOTH quantity. Which is awesome. Freeze in batches and use when you can’t be bothered cooking. No excuses. Get cooking. Get happy. Look at your mixture, it might be too sticky (add in a touch of any flour you like – chickpea/coconut/wholeweat). Whatever mixture leftover that you aren’t using, wrap into plastic sandwich bags. I separate into two handfuls per bag. Freeze for when you next need them! That’s it. Truly, I am not consciously simplifying it. Try it and you’ll see. Too easy. Enjoy and saha to you! My favorite place in the world too! Okay, question, what do you mean by a “bunch” tablespoon, handful?